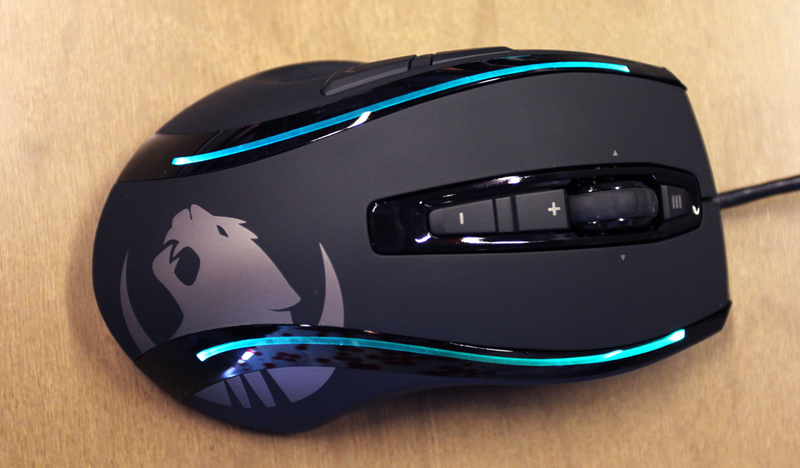 The Roccat Kone+ is quite a large gaming mouse, but it feels extremely comfortable to use. Its rubberized body provides a fi rm grip and a much higher level of comfort. Both sides of the mouse are ergonomically carved out, allowing for better movement. Apart from the standard left and right buttons, the Kone+ consists of fi ve buttons and a 5-way scroll wheel. It also features a special button known as EasyShift+, which allows the user to double the overall functionality of the buttons. This means that you can assign two functions to a single button, giving the user a total of 24 unique functions via the 12 buttons. However, this can only be done via the application provided with the product. The application also comes with a Macro Manager that allows you to either redefine the already existing macros or create your own. Five control profiles are featured in the application to be used in accordance to the game type. Moreover, each profi le can be directly linked to three different games, thus allowing the set profiles to automatically load when you boot up a game. To further enrich your gaming experience, the Roccat Kone+ comes with a modular weight system that sits at the bottom. The supplied weights (four in total), each weighing 5 g, can be fit towards the bottom, thereby enhancing the overall precision and movement of the mouse.It costs around Rs:7,550 INR.It's Very Expensive when looking at its features.